RAJKUMARI KUNWAR, 70 years old, lay inert on her cot when a few people entered her small hut in Rajharakharmi village on July 23. They could count the ribs on her frail body. The pots and pans lying around were covered in dust. An aluminium glass lay toppled by her bed. "We knew at a glance that Kunwar had died of starvation," said Binod Kumar, secretary of a non-profit Sampoorna Gram Vikash Kendra (SGVK). 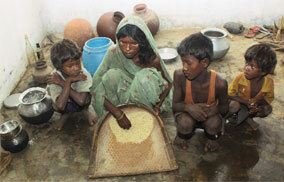 A neighbour Madho Rikisyan said Kunwar was too weak to go out of her home and had no food for 10 days. A five-member team from Palamu district headquarters who visited Kunwar's hut declared she died of disease caused by starvation. At least 20 persons have died of hunger in droughthit Palamu in July and August, SGVK field workers said. The administration's report admits to 10. The Korwa, a Scheduled Tribe people of the region, too have nothing to eat. Failed crops force them to boil leaves of surbari (known to cause dysentery) and other plants and eat them. "This is all we have to fill our stomach. We know it may kill us," Tibhu Korwa of Dhulua village said. Most men in Dhulua have migrated. Those who have stayed back try to sell anything they can get their hands on. This includes tin roofs and door-and-window frames. The Down To Earth correspondent was offered a tin roof for Rs 80 by Baidyanath Korwa. His was among the 15 families given houses under the Birsa Awas Yojana, a government housing scheme. Korwa said everyone else is doing the same. His brother Bhukhan, he said, tried to repay the money he took from a money-lender with doorand- window frames. But that was not enough. "Salim Mia (the money-lender) has now taken my brother's family to work in his factory to recover the dues. They will work as bonded labourers for a few months," Baidyanath said. Bhukhan's neighbour Tahal Korwa is working for another money-lender, Rangato Yadav, from whom he borrowed a sack or rice and a few hundred rupees. His home, too, is abandoned. Palamu's poor could have been saved from hunger with ration from the government managed public distribution system (PDS). But nearly half the people do not have ration cards that would entitle them to 35 kg free-of-cost foodgrains every month. "We are aware that there are a number of BPL (below poverty line) families who do not have cards. Steps have been taken to redress their grievance," said Amitabh Kaushal, deputy commissioner of Palamu. His claims are belied by frequent protests all over the district for foodgrains. A group of 200 angry women stopped Kaushal's vehicle in Katubal village for nearly half an hour on August 7. They were demanding ration for their children. Many of those who do have the cards are no better off. In Samarva village, for instance, an enterprising postman offered villagers Rs 20 a day in exchange for their BPL cards. Villagers said the postman would collect 100 kg foodgrains from the PDS outlet 5 km away and earn Rs 1,000 a day by selling the grains in the market. The villagers now want their cards back but the postman, Ashok Karketta, is missing. Kaushal acknowledged the severity of this year's drought. "But even universal PDS (rations for all) and employment under National Rural Employment Guarantee Scheme cannot solve the problem. Villagers need to grow crops that require less water," said Kaushal. The administration has been trying to motivate the tribals to grow alternative crops using groundwater but in vain. Handpumps were installed in a few villages but the farmers were not interested in growing any crop other than rice. "They can't think beyond rice," an agriculture officer said. Non-profits who could have helped by distributing foodgrains and medical relief are nowhere to be seen.